The Bosch PS82BN 12 V Max EC Brushless 3/8 In. 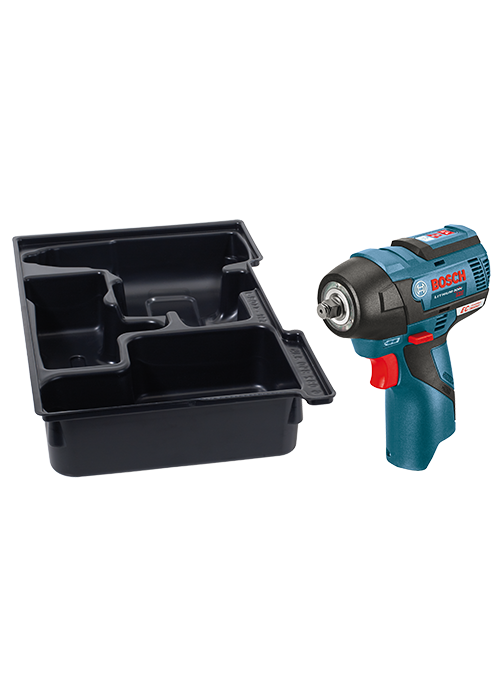 Impact Wrench with Exact-Fit Insert Tray features a lightweight, high-efficiency impact wrench that can accomplish 85 percent of the driving tasks found on professional jobsites. The most compact 12V 3/8 In. impact wrench in its class, the PS82 has a 5.5 In. head-length and weighs just 1.6 Lbs. But this dynamo delivers 85 Ft.-Lbs. of max torque, ideal for serial driving tasks, as well as no-load RPM ratings of 0-1,200 and 0-2,600 and no-load impact per minute ratings of 0-2,700 and 0-3,100. It has the Bosch performance control system, which supplies two speed settings, one for high speed and high torque and one for low speed and low torque. And it provides a maintenance-free EC Brushless motor, an upgraded all-metal gearbox and an optimized impact system – which together allow for unmatched efficiency, great runtime and longer life. This wrench has a 3/8 In. square drive anvil and a three-LED light ring.